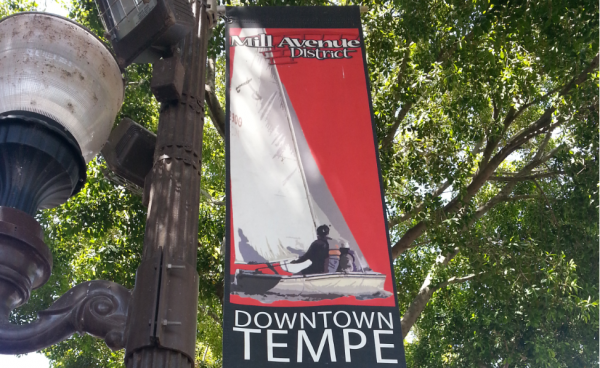 So you’re strolling down Mill Avenue and happen to look up at one of the “Downtown Tempe” posters and what do you see? A Buccaneer 18! The photo brings together an interesting group of AYC Bucc sailors in one shot. The boat is my first Erin Morgan, #5060, on one of its early sails in 2003, skippered by David Rawstrom with me as crew and sailing with Pat Blumm’s sail #2900 because the sails that came with the boat had a few “problems” (i.e. holes). 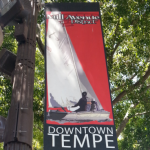 Congratulations to AYC and the Bucc Fleet for being part of the Mill Avenue District campaign!